Tammy Shoranick was an IILJ Scholar from 2005-2008. After receiving her J.D. 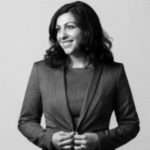 from NYU Law in 2008, she went on to work as a litigation associate on corruption and bankruptcy files at White & Case and was also a litigation associate at McCarthy Tetrault in Vancouver. Tammy currently provides research support to Boughton Law’s lawyers and clients across the firm’s practice areas. She researches complex legal issues, prepares opinions for clients, and develops submissions for court and other proceedings.